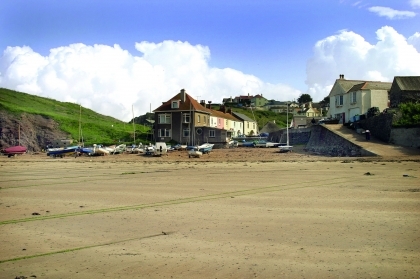 Hope Cove large beachfront holiday cottage that sleeps up to eight and is pet friendly. Located just a few steps from two golden sandy beaches where lazy summer days can be idled away digging sand castles, indulging in serious cream teas, paddling in the rock pools but close enough to nip back ‘home’ to cool off and have a sand-free lunch in the garden! This delightful terraced cottage, originally a pair of coastguard cottages, is tucked below Shippens, the grassy hillock, that divides the beaches of Outer and Inner Hope in the middle of the picturesque seaside fishing village of Hope Cove. Accommodation: Ground floor sitting room, feature fireplace with wood burner, TV, DVD, video and CD/ stereo. Kitchen, electric cooker, microwave, fridge/freezer, dishwasher and washing machine, access to garden. Snug. Dining room. Bathroom with shower over bath and separate WC. First floor bedroom 1, single bunk beds. Bedroom 2, double bed and adjoining bedroom 4. Bedroom 3, single bunk beds (awkward step into room). Bedroom 4, king size bed. Outside: Unfenced rear garden laid to lawn with garden furniture (garden not fenced from other properties in terrace). Included: Travel cot, child’s booster seat, initial supply of logs, electricity and heating (night storage). No bed linen or towels provided. Please Note: Children should be supervised in the garden.